Slip-on Loafers Casual or Dress from Gap. Brand New with Tags, Mint Condition. These are toddler/little kid size 6. Gymboree High Top Shoes Baby/Toddler Boy Size 6 NWT NEW. Shipped with USPS First Class Package. Zara Toddler Boy Navy blue suede loafers shoes. Preowned good condition. Minimal bottom wears. Very good condition Native Rubber Red loafer Shoes Waterproof girls Purple pink Toddler sz C 9. Darling little-man shoes! we don't strive to profit on S&H, but we attempt to be fairly accurate as to not lose money. Excellent condition TOMS Toddler Baby Girls 5 NEW T5 21 Gold Sparkle Loafers Shoes 42LO412 kq. Condition is Pre-owned. Shipped with USPS First Class Package. Toddler Boys Gray Nautica Slip-on Loafers ~ Size 9. Condition is Pre-owned. My boy used once. Excellent Condition. NEW GAP KIDS little girl sz 12 loafers. keep us as a favorite and check in occasionally. we don't strive to profit on S&H, but we attempt to be fairly accurate as to not lose money. Ugg I Sivia Infant Shoe/loafer/slipper Unisex Size 4/5 (12-18months) Chestnut Brown Loafer. Condition is New with box. Shipped with USPS First Class Package (2 to 3 business days). Gap Toddler Boys Boat Shoes. Tab at ankle for easy pull on. Sturdy rubber outsole. Fabric & Care. We look forward to serving you. Sizes are as stated. Not responsible for the way the printed size fits. This is a pair of SPERRY TOP-SIDER infant boy shoes. NEW IN BOX. The size is 3M (6 to 9 months). Color can vary depending on individual’s computer screen. Velcro closure. Brown with plaid sides. Robeez Trendy Trainer Leather Slip-On Soft Sole Toddler Shoes. Size 12-18 Months (US 4.5 - 6 Shoe Size). 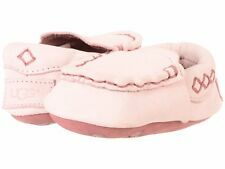 Dawgs Toddler Girls Kaymann Frost Loafers NEW! Choose size/color! FREE SHIPPING! Sperry boys size 9M "Intrepid" classic loafers in dark brown. Leather uppers. Gently used in good condition. Minor wear and a few dark spots on the leather. NEW blue TIMBERLAND EARTHKEEPERS loafers. this formula includes lots as well. SPERRY shoes. huge deal, fabulous shoes, classic look. new, on box. Cute boys boat or dock shoe. Great condition and from a smoke-free home. The Children's Place Black Faux Pebbled Leather Dress Shoes Loafers. US 7 (Toddler). Material: Synthetic Leather / All Man Made. Snynthetic Pebbled Leather Upper. Color: Black. Sperry Top-Sider. Bahama Crib Jr./Navy. Navy blue top-siders for baby girls. Baby Girl Size 3 M (6-9 Months). Shoes slip on and fasten with hook and loop closure. Silver ties on top do not untie. SPERRY loafers. this formula includes lots as well. darling, pricey, classic shoes in excellent condition. we don't strive to profit on S&H, but we attempt to be fairly accurate as to not lose money. Shoes are in good condition! No rips to leather. Shoes feature fun design, with white accents on blue. Loader style. Shoes are in excellent condition! Great shoe for fall. See pictures for details. Satisfaction guaranteed! Brand New! These adorable shoes where in my sons closet and I totally forgot about them... Would be perfect for Easter!